Coverking Accessories Now Available at Pelican Parts! Great news! 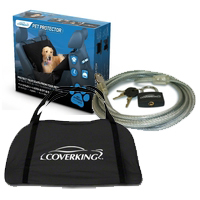 We’ve added in even more product from Coverking just for you! The makers of world class custom car covers, seat covers, floor mats and dash mats also has a plethora of car accessories that you may be looking for. Shop everything from stormproof car cover storage bags, lock and cable kits, pet protection seat covers and more. Let Coverking be your go-to when it comes to protecting your car from many of life’s obstacles!